There is little noticeable darkening of the day as a solar eclipse approaches totality until the last few percent of the sun's disc is covered. A deeply cloudy day filters 80 or more percent of the sun and your eye will easily compensate for the loss. The last few percent of the sun's surface disappears relatively quickly if you are in the path of totality and that is the reason for making the trip. It is almost like sliding a dimmer switch slowly to the off position. As the darkening was just becoming apparent to my eye, I decided to shoot some video of the surrounding eclipse watchers with my subcompact pocket digital camera. Just after I began, I saw the shadows of a flock of 80+ geese pass by on the ground. I looked up to follow them as many others were doing and continued to follow them as the poor things experienced this surprise of nature in the early afternoon. The tight V-shaped formation broke and it was every goose for themselves! Over the course of a minute, as the sky darkened, the effect was spectacular as you can tell from the reaction of the crowd. The sun's corona was bright - and white as any light I have ever seen. Venus appeared nearby. Was that really two and a half minutes of totality? It felt like thirty seconds. I never did get back to the camera on the tripod. The geese video beats anything I would have gotten otherwise. 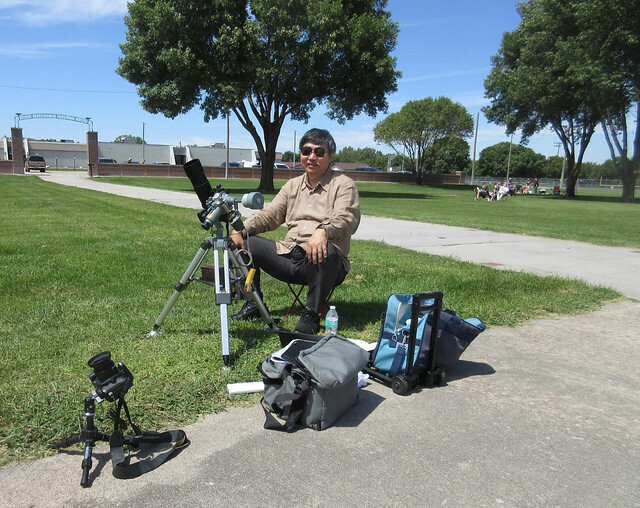 After totality, we crossed the street to Hall County Veterans Park where I found a serious photographer/astronomer who was set up with a telescope, camera, laptop and associated gear to get some great pictures. He showed me a couple of his pictures and let me look through the eyepiece of the setup to watch the receding crescent. 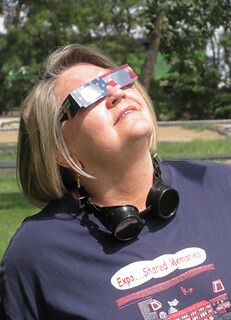 I have seven years to get properly equipped for the next eclipse. I now see why people chase these things. With the eclipse due in Beatrice just after 1:00 p.m., we were up early for the final leg of the trip from Sioux City, Iowa. 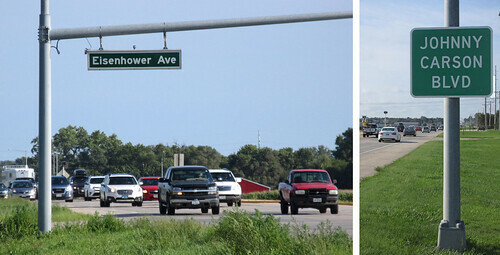 It is about a three hour drive down the freeway, to Omaha and through Lincoln. 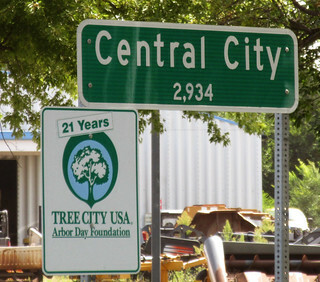 I decided that a four hour route around the larger cities might be wise under the circumstances so we headed due west on US 20 and then south on US 81. After breakfast, we soon approached Columbus and faced a decision. 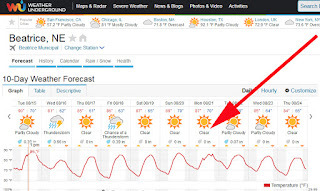 The sunny day we had been promised a week earlier was not going to be here. Looking to the southeast, we saw clouds but to the southwest there was blue sky. We decided to leave Beatrice to Bill Nye, the science guy with the bow tie. We turned toward Grand Island instead. 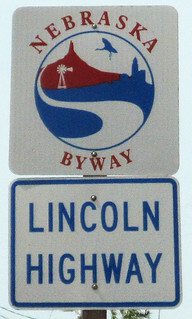 This put us on U.S. 30, The Lincoln Highway. We were quickly in the path of totality and began to see eclipse viewers on both sides of the road. 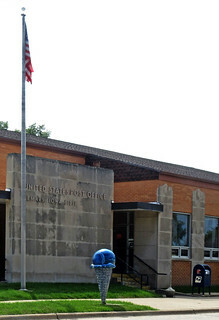 At Central City, a group was gathered in front of the library. 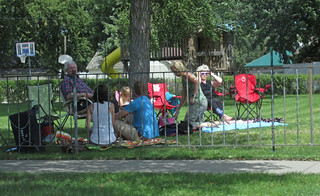 Others sat in lawn chairs in their front yards. The hardware store had a grill going with hot dogs. 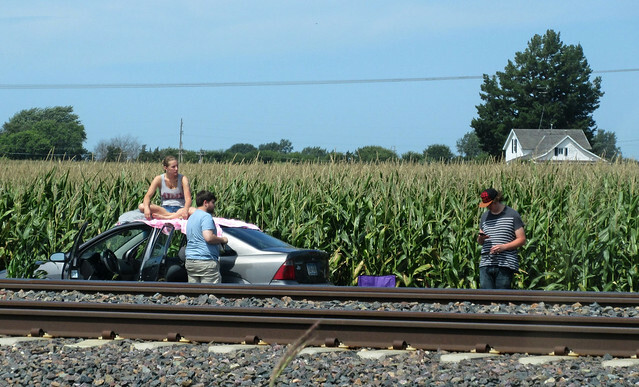 In between towns, folks just pulled off the road by the corn fields. 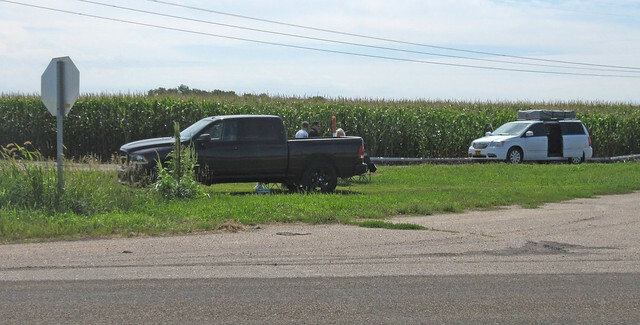 With no specific location in mind in Grand Island, we headed toward the WalMart parking lot, certain that there would be a crowd watching there. But on the way we saw a delightful city park and pulled in there to set up shop. We had two set of glasses for eye protection. I had a camera on a tripod plus my usual compact digital camera. 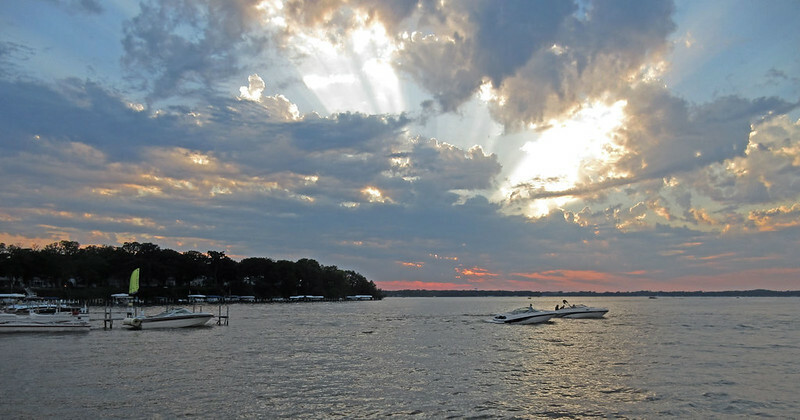 We spent our first night in the "Great Lakes" area of northwest Iowa near the shore of Lake Okoboji. 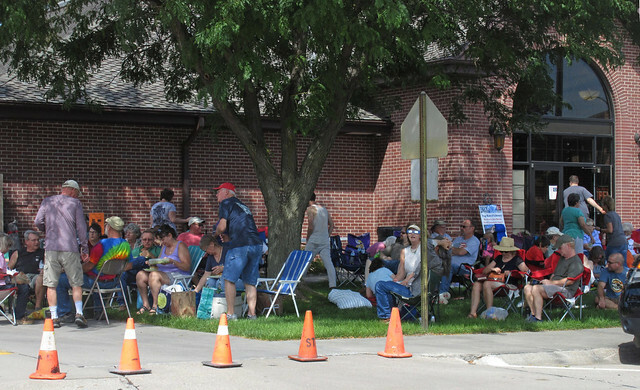 This happened to be the weekend of the "boji bike rally" so there was quite a crowd around the lake. 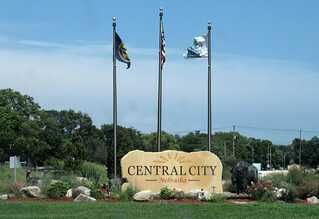 The next day required only a short drive through the fields of corn and soybeans to arrive at our home base of Sioux City, Iowa. 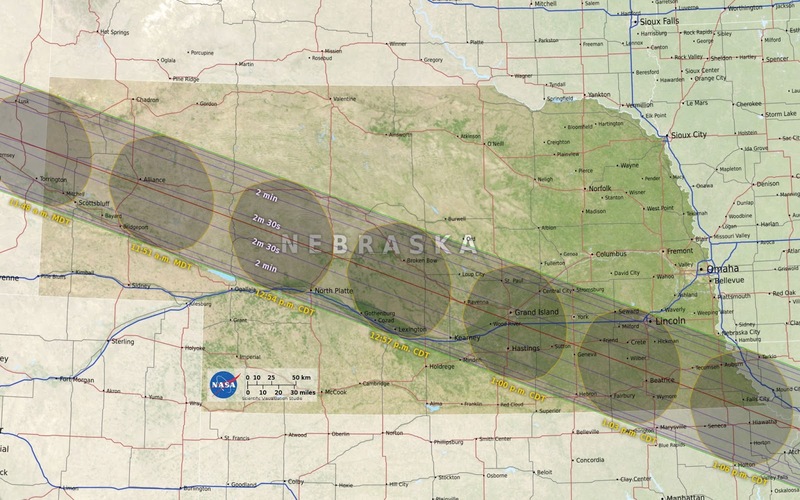 Had I planned a bit farther ahead, we might have located closer to the path of eclipse totality in Nebraska but hotel rooms were scarce a month ahead of the event. 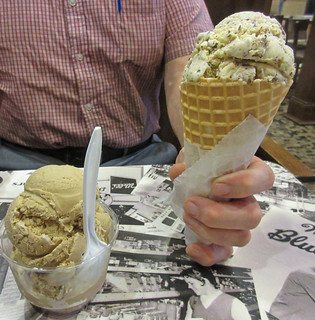 The short distance traveled on this day gave us plenty of time for a stop at Le Mars, Iowa - proclaimed by the Iowa Legislature as the "Ice Cream Capital of the World." This is the home of the Wells Dairy, a business once purchased for $250 and now the site of the Blue Bunny Ice Cream manufacturing operation. This 900,000 square foot plant employs 1,000 people making ice cream and other treats such as the red white and blue Bomb Pop. 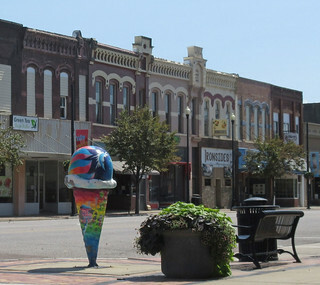 There are ice cream cone sculptures around town from the Post Office to churches. 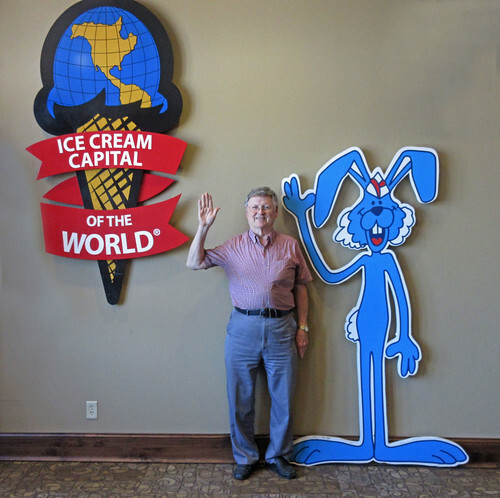 We followed the signs to the Blue Bunny ice cream parlor and museum. The museum was rather sparse - nothing like the Kool Aid Museum in Hastings, Nebraska. 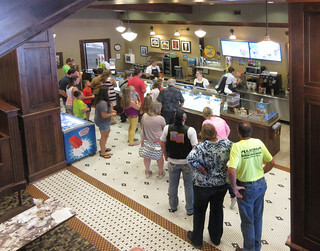 But the ice cream parlor was outstanding and makes the visit worthwhile. I posed for a picture with the Blue Bunny, of course. 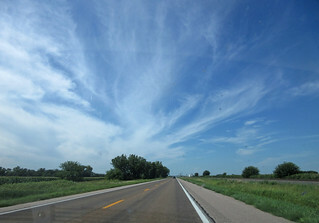 It's not a long journey from our home in Bloomington, MN to our chosen viewing spot near Beatrice, Nebraska. Google Maps puts it at around 460 miles. Of course, we take the scenic route which adds some distance and a lot of time. 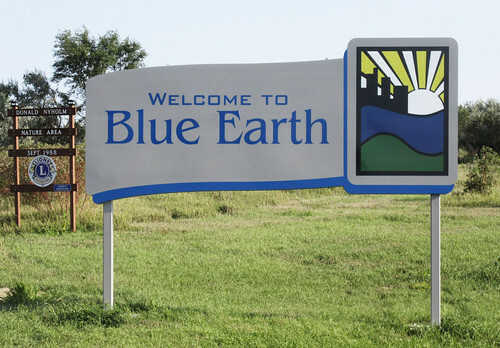 We left Saturday afternoon and made our first stop at Blue Earth, Minnesota. 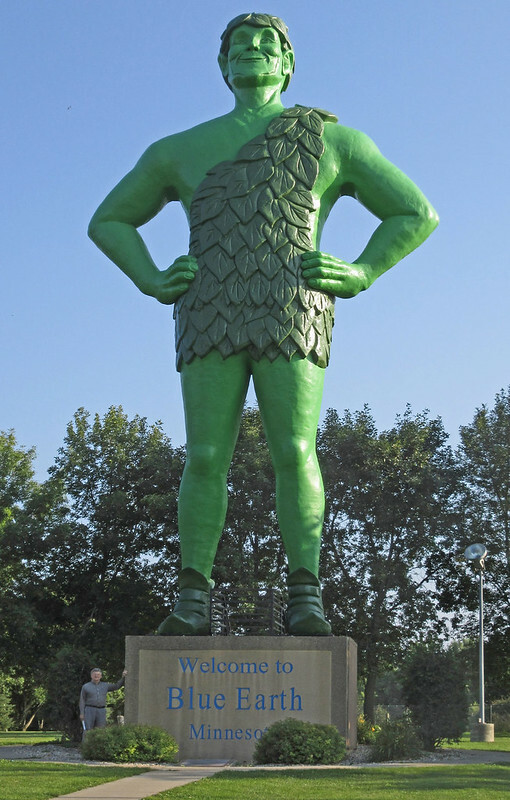 Minnesota is home to two legendary giants, Paul Bunyan and The Jolly Green Giant. 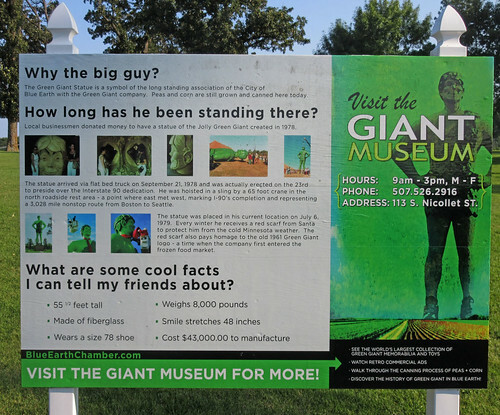 While The Jolly Green Giant is reputed to actually live in the Minnesota River valley near the town of LeSueur, his most famous likeness can be found near I-90 in the town of Blue Earth. Here I am standing beside the base of the big guy. The Green Giant company has long had a canning plant in Blue Earth to pack the peas, green beans and corn that are associated with this famous trademark. 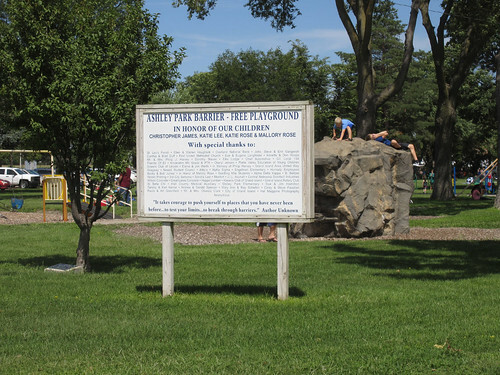 The statue was put in place in September of 1978 just as I-90 was completed in the area making it the nation's first transcontinental (Boston to Seattle) Interstate. 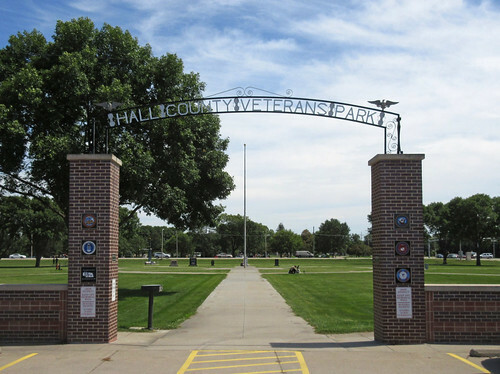 The statue is located about a half mile south of I-90 along U.S. highway 169. 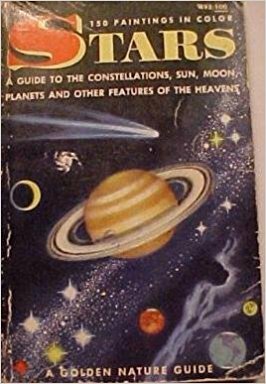 When I was still in grade school in Portland during the 1950s, I became aware of the total solar eclipse coming in 1979. It was no doubt shown in this Golden Guide to the Stars that I can't seem to find in my many boxes of books right now. 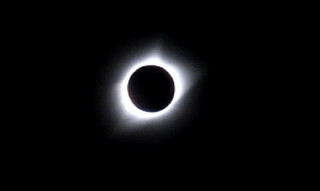 Unfortunately, I had moved from Portland, which was in the path of totality in 1979 and missed the grand show. But now it is 2017, and Linda and I are not going to miss this year's show. If you have not convinced yourself that you need to get to a cloudless location in the path of totality next week, perhaps this writer at Wired can help motivate you. Or this description of the 1979 eclipse from Oregon Live. "As the event began and the sky started to darken, a hush fell over the crowd. Everyone overcome by what was happening. As the moon completely blocked out the sun and the sky went black, the silence was complete: no birds sang or chirped, no words were spoken, although a collective gasp of appreciation of the power of nature filtered through the crowd. It literally gave us goosebumps." We have decided to watch from an area near Beatrice, Nebraska, a bit south of Lincoln. 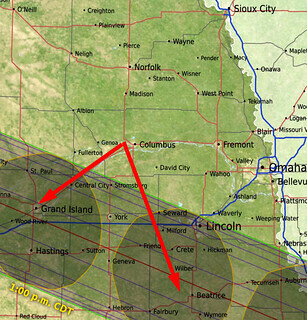 Here is the path of totality through Nebraska. Why Beatrice? Well, it is almost directly in the center of totality, it is only 150 miles from the nearest available motel room (I should have started looking much earlier!) 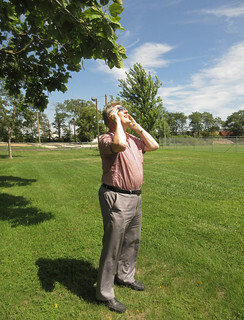 it is on the list of 29 epic places to watch the eclipse and the nearby Homestead National Monument is planning special activities. As a worst case, we can find a spot in the rural area if traffic gets too bad. 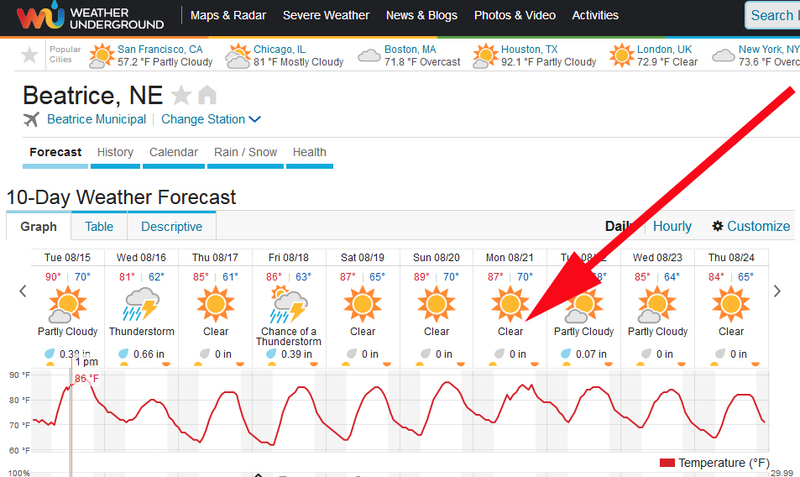 At this point, the weather forecast is looking very favorable. If you are wondering about where the eclipse paths have been and will be over a 150 year period, I put together this composite map from the NASA website.